“Her name is Lady Sun (Khorshid Khanom), or Mitra I guess. She was the goddess that our ancestors in Iran worshiped long time ago.” I explain to a friend of mine who is looking at Iranian artworks. I look at the Lady Sun, the first thing that catches my eyes are her eyebrows. The so called unibrow is the landmark that carries the symbol of Iranian beauty. I remembered once my dad looked into my face, and then turned to mom and said, “Remember you had thick and beautiful eyebrows like her when we got married what happened to them?” It is too much for a man like my dad to remember anything physical, and to confess that he was in love with anything. But the eyebrows, revealed at least another side of him. Me and my sister were complaining yesterday, that no one in America does eyebrows the way they do them in Iran. In fact I think I can declare Iran the Eyebrow Nation. 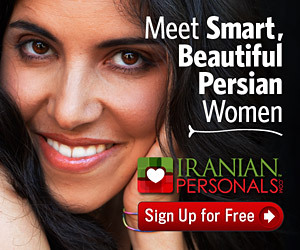 The French are obsessed with legs, Americans with breasts, Brazilian with butts and for us Iranians, it&apos;s eyebrows. I know it sounds lame or even gay, but I feel as if it&apos;s the truth. Every Iranian man has the memory of the most beautiful pair of eyebrows that he has ever seen; the eyebrows as beautiful as Lady Sun&apos;s.
Every Iranian girl has a memory of the first day she made her eyebrows; the day she could shape it, the day she felt the most beautiful. When we want to describe a girl in Iran the first thing is, “The girl with the… eyebrows.” The body is not that important for an Iranian girl, at least not as important as her eyebrows. Eyebrows are all over Iranian paintings, they have been for ages, nobody can deny that. Maybe in all the years when Iranian women have had to cover themselves up, they have only allowed men to see their eyebrows, and that&apos;s why eyebrows have become such an essential part of Iranian beauty. Maybe if we didn&apos;t have to cover ourselves up, society would have been obsessed over other parts of the Iranian woman. We are all over the eyebrow and we are obsessed with it. If you don&apos;t believe me go and take a look at yourself.